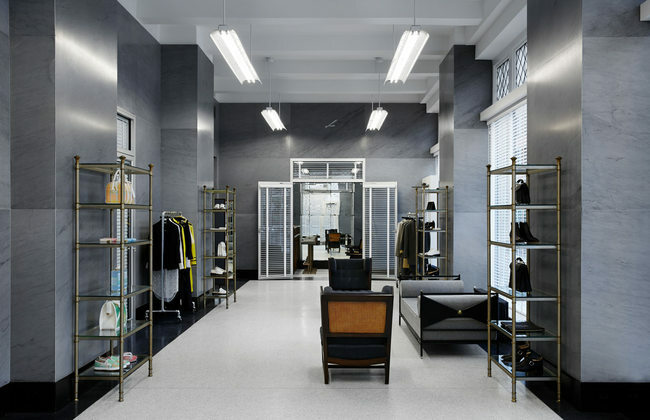 Thom Browne this week unveiled a new women’s section at its New York City store on 100 Hudson Street. The American designer expanded his Tribeca flagship store that opened in 2006 to house a dedicated womenswear store. The neighboring storefront at 100 Hudson Street was vacant for one year before the brand decided to occupy the space. While the men’s store is still located on the north side of the block, the women’s store has an entrance on the south side and is flanked by an entrance to the building. The new women’s store features the same interior as the men’s store, with custom-poured terrazzo floors and gray Bardiglio marble walls, as well as furniture by Jacque Adnet, Paul McCobb, and Edward Wormley. The space is almost finished—Thom Browne will complete the store’s bar area at the rear of the space that features stools designed by Maison Jansen and chairs by Pierre Jeanneret. The store will be completed in entirety by July. The women’s section was previously located in the back of the men’s store, but this space has been changed to a made-to-measure salon. The new section also leads to the fitting room and a hallway that connects to the women’s store. The expansion follows the opening of the brand’s first European store in Milan. The monobrand store located at Via del Gesù is the label’s 19th global store joining locations in Tokyo, Beijing, Seoul and Hong Kong. This entry was posted in Design and tagged new york, Store Opening, thom browne. Bookmark the permalink.